ANAHEIM.–The disappointment was stark and painful, like a punch in the gut that simply would not stop hurting. One Culver City player, however, retained her composure, kept a stiff upper lip and did her best to put it all into perspective. It was her shot, after all, that propelled the Centaurs into the final, so she felt a sense of duty to persevere, even in the face of disheartening defeat. Taylor Tanita looks to set the Centaurs’ offense. Tanita is one of two seniors on a squad that had but two returning Varsity players yet made it all the way to the championship match. Her comparative lack of emotion after the loss was less apathy than focus on the task ahead: the CIF State Tournament, which gets under way Wednesday for Culver City. The Centaurs will travel to City Section champion Granada Hills for their first-round, Div. II matchup. Granada Hills features Kristi Nishida, Jenna Matsushita, Taylor Mayeda and Gwen Machado. A key to Culver City’s loss to Murrieta Valley was simple: size. 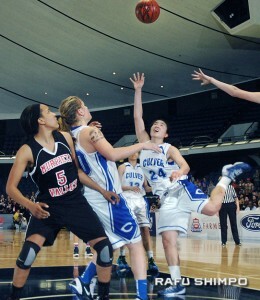 The Nighthawks have height in the middle, with 6-foot-1 center Brynn Dahmer and 6-foot guard Karen Wolf. Five of the six players used by Murrieta Valley were 5’8” or taller. Tanita explained, however, that the Centaurs are usually effective in handling taller teams. They need to be; no player on their roster approaches six feet, and only two of their starting five Saturday stand above 5’8”. 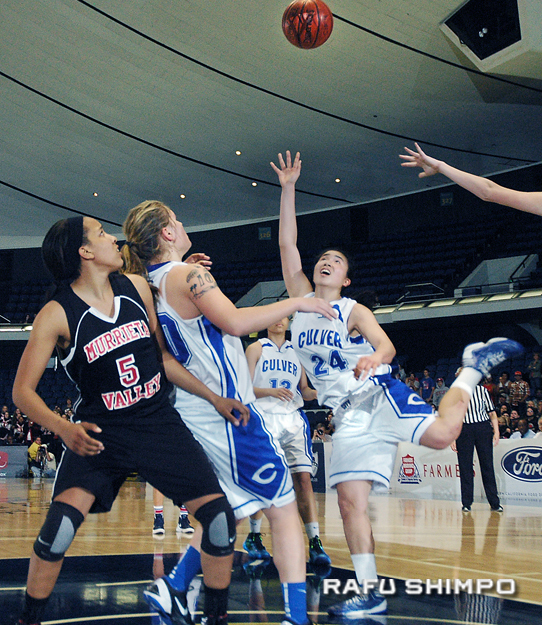 Kelsey Ueda is forced into taking an off-balance shot in the fourth quarter on Friday. Ueda tied the game high with 14 points. “Normally, we do better in rebounding, even if the other team is taller. We just didn’t do a good job of boxing out,” she said. Culver City (24-6) kept close for the first three quarters, outscoring the Nighthawks in the third quarter, which ending with Murrieta Valley holding a slim 31-27 lead. It was in the final frame, however, that the Nighthawks began to use their size advantage to dominate the boards, ending the game with 44 rebounds to Culver City’s 30. Murrieta Valley (26-5) particularly shined at the free-throw line, making 13 of their 16 attempts. Culver City head coach Julian Anderson said the inside discrepancy, coupled with his team’s inability to sink shots when they needed them most, was ultimately the difference. “We got some really good looks, we just couldn’t get a lot of our shots to fall,” he said. Tanita finished with 12 points for Culver City, while junior guard Kelsey Ueda tied the game high with 14 points, to go along with 10 rebounds. Frosh Kate Suyetsugu connected on one of her two 3-point attempts. Tanita’s mother, Lisa, said Taylor wouldn’t likely let the disappointment of Friday’s loss linger, knowing that State is coming up. Coach Anderson said he reminded his players to focus on the fact that their season is not yet finished. “When you live to play another day, that’s motivation in itself,” he said. -Windward, with Courtney Jaco. As the top seed in the Open Division, they will have a bye in the first round. -Troy, featuring Jennifer Ida, Kara Ito and Cori Okada, will play in the Open Division Friday, in a first-round game against Brianne Yasukochi and La Jolla Country Day. -Mater Dei features Anela and Kau’i Miki-Han, and will enter Open Div. play Friday at home against Stockdale. 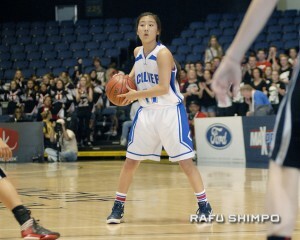 Game time is 6 p.m.
-El Camino Real, with Alyssa Ogawa, who play in Div. I Wednesday at Bishop Amat. -Mark Keppel, whose roster includes Jodi Aiau, Alyson Lock, Lauren Saiki, Tammi Matsukiyo, Michelle Ojiri, Kelli Kamida, Ashley Lee, Kellie Benson and Kyrstin Nakamura. The Lady Aztecs host Monroe Wednesday in their Div. II opener. -Selma, with Tommie Tagawa, who play in Div. III beginning Wednesday at Calabasas. –Kristy Omura and El Dorado, also in Div. III, who open Wednesday at Our Lady of Peace. -JSerra, with Coco Miller, who will host Mater Dei Catholic Wednesday in Div. IV. -Bishop Montgomery, who will play in Div. IV beginning Wednesday at Bishop’s. The Knights feature Nao Shiota and Kate Tokuhara. -Ocean View Christian and Nikki Mitsuoka will begin play in Div. V on Wednesday at home against Mesa Grande. -Flintridge Prep, with Maya Okamoto and Katharine Yamamoto, will be play Wednesday against Kiana Fujioka and Immanuel in their Div. V opener. –Kristie Kawamoto and Providence play host to Tri-City Christian Wednesday in Div. 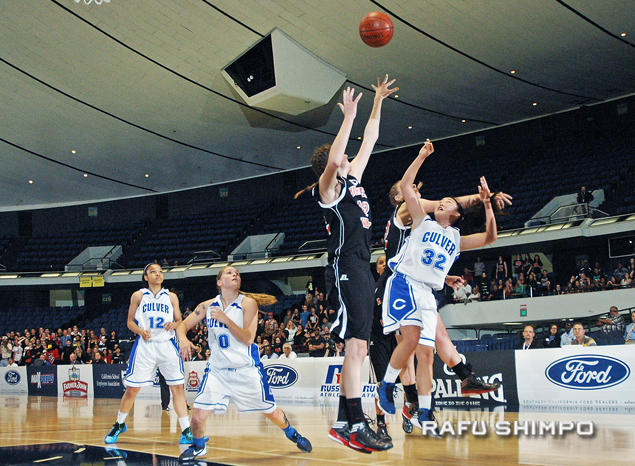 V.
For the latest updated brackets and information, visit www.cifstate.org.